For our 40th wedding anniversary, my husband and I enjoyed a relaxing weekend in Red Wing, Minnesota. It was one of the best weekend trips we've ever taken. 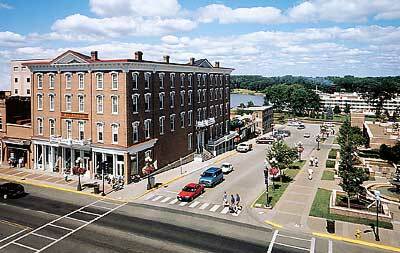 A town of about 15,000, Red Wing is nestled on the banks of the Mississippi River. It's named after the symbol of the Mdewakanton Dakota tribe, which was a swan's wing dyed red. We stayed at the St. James Hotel in the heart of downtown. Built in 1875 and listed on the National Register of Historic Places, the hotel has been restored to its original Victorian elegance. All 60 rooms are named after riverboats, and no two are alike. The staff pampered us with excellent service, and the food at the Veranda Restaurant and the Port of Red Wing — both located in the hotel — was excellent. We spent much of our stay walking around town, which in summer features more than 300 flower baskets, courtesy of a joint city/Kiwanis Club project. It was very relaxing to browse in antique shops and watch the boats from Levee Park behind the hotel. Red Wing is known for its salt-glazed pottery and Red Wing shoes, so we enjoyed visiting the Red Wing Shoe Museum and the Historic Pottery District. You'll also want to see the renovated Sheldon Theater, at the corner of Third Street and East Avenue. Built in 1904, it was America's first municipal theater. Then there's bowling at Nybo's Landing (located in the Pottery District on Withers Harbor Drive)… the Goodhue County Historical Museum (open daily except Mondays at 1166 Oak St.)… the scenic view from Barn Bluff (routes to the top start at East Fifth Street)… and more. We only stayed for 2 nights, but you could easily spend much more time exploring this charming area. Red Wing is located in southeastern Minnesota along U.S. Highway 61, about 55 miles southeast of Minneapolis/St. Paul. For information, contact the Red Wing Visitors and Convention Bureau at 1-800-498-3444. All rooms at the St. James Hotel are handicapped accessible. For reservations, call 1-800-252-1875. Watch pottery ar-tisans at work at the Red Wing Stoneware Company, about 4 miles west of downtown along Highway 61 (1-651-388-4610). Tours are available on weekdays at 1 p.m.
From April through October, you can watch river traffic traverse Lock and Dam #3 north of town.